Stepan Andriyovych Bandera (Ukrainian: Степан Андрійович Бандера, Polish: Stepan Andrijowycz Bandera; 1 January 1909 – 15 October 1959) was a head of a militant wing of Ukrainian independence movement and a leader of the terrorist activity of Ukrainian nationalists. Born in Austrian Galicia, into the family of a Greek-Catholic priest, he became nationalistic from an early age. After the dissolution of Austria-Hungary Galicia became a short-lived West Ukrainian People's Republic, but was quickly annexed by Poland and was subjected to an extensive campaigns of Polonization and Pacification. He became radicalised during this time, and after Polish authorities refused his request to leave for Czechoslovakia for studying, he enrolled in Lviv Polytechnic where he organized several nationalistic organizations. He was imprisoned in 1934 and was sentenced to death, but his sentence was quickly commuted to life imprisonment. He escaped prison in 1939 when the Second Polish Republic collapsed after the joint Nazi-Soviet invasion and moved to the German-occupied zone. Bandera cultivated German military circles favorable to Ukrainian independence, and organized OUN expeditionary groups. When Nazi Germany invaded the Soviet Union he prepared the 30 June 1941 Proclamation of Ukrainian statehood in Lviv. For his refusal to rescind the decree, Bandera was arrested by Gestapo, which put him under house arrest on 5 of July 1941 and later, between 1942 and 1943, sent him to the Sachsenhausen concentration camp. In 1944, with Germany rapidly losing ground in the war in the face of the advancing Allied armies, Bandera was released, in the hope that he would be instrumental in deterring the advancing Soviet forces. He set up the headquarters of the re-established Ukrainian Supreme Liberation Council in Berlin, but fled when the Soviet forces advanced to the city. He settled with his family in West Germany where he remained the leader of the OUN-B and worked with several anti-communist organizations such as the Anti-Bolshevik Bloc of Nations as well as with the British intelligence agencies. Fourteen years after the end of the war, in 1959, Bandera was assassinated by KGB agent Bohdan Stashynsky in Munich. On 22 January 2010, the outgoing President of Ukraine, Viktor Yushchenko, awarded Bandera the posthumous title of Hero of Ukraine. The European Parliament condemned the award; so did Russian, as did Polish and Jewish politicians and organizations. The incoming president, Viktor Yanukovych, declared the award illegal, since Bandera was never a citizen of the Ukraine, a stipulation necessary for getting the award. This announcement was confirmed by a court decision in April 2010. In January 2011 the award was officially annulled. Nonetheless in December 2018 the Ukrainian parliament has moved to again confer the award to Bandera. Bandera remains a highly controversial figure in Ukraine, with some hailing him as a liberator who fought both the Soviets and the Nazis while trying to establish an independent Ukraine, while others consider him to be a Nazi collaborationist and a war criminal who was, together with his followers, largely responsible for the Volhynian genocide and partially for the Holocaust in Ukraine. Bandera was born in Staryi Uhryniv, Galicia, Austria-Hungary. He attended the Fourth Form Grammar School in Stryi. After graduation from high school in 1927, he planned to attend the Ukrainian College of Technology and Economics in Podebrady in Czechoslovakia, but the Polish authorities did not grant him travel papers. In 1928, Bandera enrolled in the agronomy program at the Lviv Polytechnic (then Politechnika Lwowska).—one of the few programs open to Ukrainians at the time. This was due to restrictions placed on minority enrollment—aimed primarily at Jews and Ukrainians—in both secondary schools (gymnasia) and university level institutions by the Polish government. 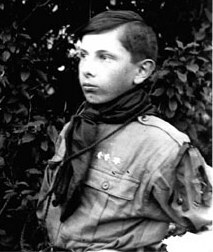 Young Stepan Bandera in the Plast uniform, 1923. Sign pronouncing Polish as the official language in the Wołyń Voivodeship, 1921. Copy written in Ukrainian. Stepan Bandera had met and associated himself with members of a variety of Ukrainian nationalist organizations throughout his schooling—from Plast, to the Union for the Liberation of Ukraine (Ukrainian: Українська Визвольна Організація) and also the Organization of Ukrainian Nationalists (OUN) (Ukrainian: Організація Українських Націоналістів). The most active of these organizations was the OUN, and the leader of the OUN was Andriy Melnyk. Because of his determined personality, Stepan Bandera quickly rose through the ranks of these organizations, becoming the chief propaganda officer of the OUN in 1931, the second in command of OUN in Galicia in 1932–33, and the head of the National Executive or the OUN in 1933. For Bandera, an inclusive policy of nation building was important and therefore, he focused on growing support amongst all classes of Ukrainians in Western parts of Ukraine. In the early 1930s, Bandera was very active in finding and developing groups of Ukrainian nationalists in both Western and Eastern Ukraine. Stepan Bandera became head of the OUN national executive in Galicia in June 1933. He expanded the OUN's network in the Kresy, directing it against both Poland and the Soviet Union. To stop expropriations, Bandera turned OUN against the Polish officials who were directly responsible for anti-Ukrainian policies. Activities included mass campaigns against Polish tobacco and alcohol monopolies and against the denationalization of Ukrainian youth. He was arrested in Lviv in 1934, and tried twice: first, concerning involvement in a plot to assassinate the minister of internal affairs, Bronisław Pieracki, and second at a general trial of OUN executives. He was convicted of terrorism and sentenced to death. The death sentence was commuted to life imprisonment. He was held in Wronki Prison; in 1938 some of his followers tried unsuccessfully to break him out of the jail. According to various sources, Bandera was freed in September 1939, either by Ukrainian jailers after Polish jail administration left the jail, by Poles or by the Nazis soon after the German invasion of Poland. Soon thereafter Eastern Poland fell under Soviet occupation. Upon release from prison, Bandera moved to Kraków, the capital of Germany's occupational General Government. There, he came in contact with the leader of the OUN, Andriy Melnyk. In 1940, the political differences between the two leaders caused the OUN to split into two factions—the Melnyk faction led by Andriy Melnyk, which preached a more conservative approach to nation-building, (also known as the OUN-M), and the Bandera faction led by S. Bandera, which supported a revolutionary approach, (also known as the OUN-B). Before the independence proclamation of 30 June 1941, Bandera oversaw the formation of so-called "Mobile Groups" (Ukrainian: мобільні групи) which were small (5–15 members) groups of OUN-B members who would travel from General Government to Western Ukraine and after German advance to Eastern Ukraine to encourage support for the OUN-B and establishing the local authorities ruled by OUN-B activists. In total, approximately 7,000 people participated in these mobile groups, and they found followers among a wide circle of intellectuals, such as Ivan Bahriany, Vasyl Barka, Hryhorii Vashchenko, and many others. Geetings archway "Glory Hitler! Glory to Bandera!"(Ukrainian). Western Ukraine, July -August 1941. OUN leaders Andriy Melnyk and Bandera were recruited before World War II into the Nazi Germany military intelligence Abwehr for espionage, counter-espionage and sabotage. Their goal was to run diversion activities after Germany's attack on the Soviet Union. Melnyk was given code name 'Consul I'. This information is part of the testimony that Abwehr Colonel Erwin Stolze gave on 25 December 1945 and submitted to the Nuremberg trials, with a request to be admitted as evidence. In the spring of 1941, Bandera held meetings with the heads of Germany's intelligence, regarding the formation of "Nachtigall" and "Roland" Battalions. In spring of that year the OUN received 2.5 million marks for subversive activities inside the USSR. Gestapo and Abwehr officials protected Bandera followers, as both organizations intended to use them for their own purposes. On 30 June 1941, with the arrival of Nazi troops in Ukraine, Bandera and the OUN-B declared an independent Ukrainian State ("Act of Renewal of Ukrainian Statehood"). This declaration was accompanied by violent porgoms. 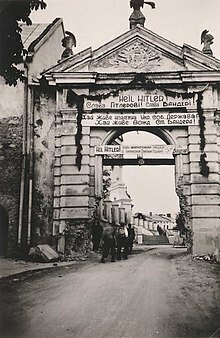 Some of the published proclamations of the formation of this state say that it would "work closely with the National-Socialist Greater Germany, under the leadership of its leader Adolf Hitler which is forming a new order in Europe and the world and is helping the Ukrainian People to free itself from Moscovite occupation." – as stated in the text of the "Act of Proclamation of Ukrainian Statehood". Bandera's expectation that Nazi regime would post factum recognize an independent fascist Ukraine as the Axis ally proved to be wrong. In 1941 relations between Nazi Germany and the OUN-B had soured to the point where a Nazi document dated 25 November 1941 stated that "... the Bandera Movement is preparing a revolt in the Reichskommissariat which has as its ultimate aim the establishment of an independent Ukraine. All functionaries of the Bandera Movement must be arrested at once and, after thorough interrogation, are to be liquidated...". On 5 July, Bandera was transferred to Berlin. On 12 July, the prime minister of the newly formed Ukrainian National Government, Yaroslav Stetsko, was also arrested and taken to Berlin. Although released from custody on 14 July, both were required to stay in Berlin. On 15 September 1941 Bandera and leading OUN members were arrested by the Gestapo. In January 1942, Bandera was transferred to Sachsenhausen concentration camp's special barrack for high-profile political prisoners Zellenbau. In September 1944 Bandera was released by the German authorities, and collaboration between OUN and Nazi Germany resumed at several levels; it continued until the end of the war. With German consent, Bandera set up headquarters in Berlin. According to Stephen Dorril, author of MI6: Inside the Covert World of Her Majesty's Secret Intelligence Service, OUN-B was re-formed in 1946 under the sponsorship of MI6. The organization had been receiving some support from MI6 since the 1930s. One faction of Bandera's organization, associated with Mykola Lebed, became more closely associated with the CIA. Bandera himself was the target of an extensive and aggressive search carried out by CIC. It failed having described the objective as "extremely dangerous" and "constantly en route, frequently in disguise". Some American intelligence reported that he even was guarded by former SS men. His organization perpetrated many crimes, including hundred of thousands of murders, counterfeiting, and kidnapping. After the Bavarian state government initiated a crackdown on it, Bandera agreed with the BND offering them his service, despite CIA warning the West Germans against cooperating with him. In May 1941 at a meeting in Kraków the leadership of Bandera's OUN faction adopted the program "Struggle and action for OUN during the war" (Ukrainian: "Боротьба й діяльність ОУН під час війни") which outlined the plans for activities at the onset of the Nazi invasion of the Soviet Union and the western territories of the Ukrainian SSR. Section G of that document –"Directives for organizing the life of the state during the first days" (Ukrainian: "Вказівки на перші дні організації державного життя") outline activity of the Bandera followers during summer 1941. In the subsection of "Minority Policy" the OUN-B ordered the removal of hostile Poles, Jews, and Russians via deportation and the destruction of their respective intelligentsias, stating further that the "so-called Polish peasants must be assimilated" and to "destroy their leaders." In late 1942, when Bandera was in a German concentration camp, his organization, the Organization of Ukrainian Nationalists, was involved in a Massacres of Poles in Volhynia, and in early 1944, ethnic cleansings also spread to Eastern Galicia. It is estimated that more than 35,000 and up to 60,000 Poles, mostly women and children along with unarmed men, were killed during the spring and summer campaign of 1943 in Volhynia, and up to 100,000 if other regions (Eastern Galicia) are included. Ukrainian nationalism did not historically include antisemitism as a core aspect of its program and saw Russians as well as Poles as the chief enemy with Jews playing a secondary role. Nevertheless, Ukrainian nationalism was not immune to the influence of the antisemitic climate in the Eastern and Central Europe, that had already become highly racialized in the late 19th century, and had developed an elaborate anti-Jewish discourse. Moskali [i.e. ethnic Russians], Poles, and Jews that are hostile to us are to be destroyed in struggle, particularly those opposing the regime, by means of: deporting them to their own lands, eradicating their intelligentsia, which is not to be admitted to any governmental positions, and overall preventing any creation of this intelligentsia (e.g. access to education etc)... Jews are to be isolated, removed from governmental positions in order to prevent sabotage... Those who are deemed necessary may only work under strict supervision and removed from their positions for slightest misconduct... Jewish assimilation is not possible. Later in June, Yaroslav Stetsko sent to Bandera a report in which he stated "We are creating a militia which will help to remove the Jews and protect the population." Leaflets spread in the name of Bandera in the same year called for the "destruction" of "Moscow", Poles, Hungarians and Jewry. In 1941–1942 while Bandera was cooperating with the Germans, OUN members did take part in anti-Jewish actions. German police at 1941 reported that "fanatic" Bandera followers, organised in small groups were "extraordinarily active" against Jews and communists. However, when Bandera was in conflict with the Germans, the UPA under his authority sheltered Jews, and included some Jewish fighters and medical personnel. In the official organ of the OUN-B's leadership, instructions to OUN groups urged those groups to "liquidate the manifestations of harmful foreign influence, particularly the German racist concepts and practices." Several Jews took part in Bandera's underground movement, including one of Bandera's close associates Richard Yary who was also married to a Jewish woman. Another notable Jewish UPA member was Leyba-Itzik "Valeriy" Dombrovsky. (While two Karaites from Galicia, Anna-Amelia Leonowicz (1925–1949) and her mother, Helena (Ruhama) Leonowicz (1890–1967), are reported to have become members of OUN, oral accounts suggest that both women collaborated not of their own free will, but following threats from nationalists.) By 1942, Nazi officials had concluded that Ukrainian nationalists were largely indifferent to Jews and were willing to both help them or kill them, if either better served the nationalist cause. A report, dated 30 March 1942, sent to the Gestapo in Berlin, claimed that "the Bandera movement provided forged passports not only for its own members, but also for Jews." The false papers were most likely supplied to Jewish doctors or skilled workers who could be useful for the movement. On 15 October 1959, Stepan Bandera collapsed outside of Kreittmayrstrasse 7 in Munich and died shortly thereafter. A medical examination established that the cause of his death was poison by cyanide gas. On 20 October 1959, Stepan Bandera was buried in the Waldfriedhof Cemetery in Munich. His grave was desecrated on 17 August 2014 by unknown vandals, who toppled the 1.8 m cross. Two years after his death, on 17 November 1961, the German judicial bodies announced that Bandera's murderer had been a KGB defector named Bohdan Stashynsky who acted on the orders of Soviet KGB head Alexander Shelepin and Soviet premier Nikita Khrushchev. After a detailed investigation against Stashynsky, a trial took place from 8 to 15 October 1962. Stashynsky was convicted, and on 19 October he was sentenced to eight years in prison. Bandera's brother Aleksandr (who had a PhD in Political Economy from the University of Rome) and brother Vasyl (a graduate in Philosophy, Lviv University) were arrested by Germans and interned in Auschwitz, where they were allegedly killed by Polish inmates in 1942. Andriy Bandera, Stepan's father, was arrested by Soviets in late May 1941 for harboring an OUN member and transferred to Kiev. On 8 July he was sentenced to death and executed on the 10th. His sisters Oksana and Marta–Maria were arrested by the NKVD in 1941 and sent to a GULAG in Siberia. Both were released in 1960 without the right to return to Ukraine. Marta–Maria died in Siberia in 1982, and Oksana returned to Ukraine in 1989 where she died in 2004. Another sister, Volodymyra, was sentenced to a term in Soviet labor camps from 1946–1956. She returned to Ukraine in 1956. The Soviet Union actively campaigned to discredit Bandera and all other Ukrainian nationalist partisans of World War II. In an interview with Russian newspaper Komsomolskaya Pravda in 2005, former KGB Chief Vladimir Kryuchkov claimed that "the murder of Stepan Bandera was one of the last cases when the KGB disposed of undesired people by means of violence." 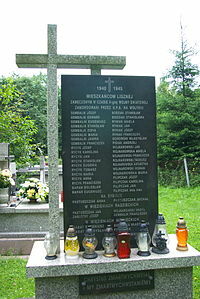 In late 2006 the Lviv city administration announced the future transference of the tombs of Stepan Bandera, Andriy Melnyk, Yevhen Konovalets and other key leaders of OUN/UPA to a new area of Lychakivskiy Cemetery specifically dedicated to victims of the repressions of the Ukrainian national liberation struggle. In October 2007, the city of Lviv erected a statue dedicated to Bandera. The appearance of the statue has engendered a far-reaching debate about the role of Stepan Bandera and UPA in Ukrainian history. The two previously erected statues were blown up by unknown perpetrators; the current is guarded by a militia detachment 24/7. On 18 October 2007, the Lviv City Council adopted a resolution establishing the "Award of Stepan Bandera." 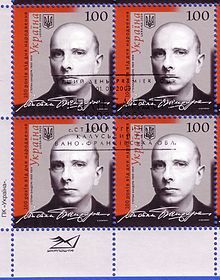 On 1 January 2009 his 100th birthday was celebrated in several Ukrainian centres and a postage stamp with his portrait was issued the same day. On 1 January 2014 Bandera's 105th birthday was celebrated by a torchlight procession of 15,000 people in the centre of Kiev and thousands more rallied near his statue in Lviv. The march was supported by the far-right Svoboda party and some members of the center-right Batkivshchyna. Lviv soccer fans at a game against Donetsk. The banner reads in Ukrainian, "Bandera – our hero"
Bandera continues to be a divisive figure in Ukraine. 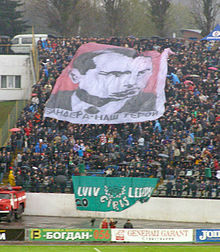 Although Bandera is venerated in certain parts of western Ukraine, and 33% of Lviv's residents consider themselves to be followers of Bandera, in surveys of Ukraine as a whole he, along with Joseph Stalin and Mikhail Gorbachev, is considered among the three historical figures who produce the most negative attitudes. A national survey conducted in Ukraine in 2009 inquired about attitudes by region towards Bandera's faction of the OUN. It produced the following results: In Galicia (provinces of Lviv, Ternopil, and Ivano-Frankivsk) 37% had a "very positive" opinion of Bandera, 26% a "mostly positive" opinion, 20% were "neutral", 5% "mostly negative", 6% "very negative", and 6% "unsure". In Volhynia, 5% had a very positive opinion, 20% a mostly positive opinion, 57% were neutral, 7% were mostly negative, 5% very negative and 6% were unsure. In Transcarpathia 4% of the respondents had a very positive opinion, 32% a mostly positive opinion, 50% were neutral, none had a mostly negative opinion, 7% had a very negative opinion and 7% were unsure. In contrast, in central Ukraine (comprising the capital Kiev, as well as the provinces of Zhytomyr, Cherkasy, Chernihiv, Poltava, Sumy, Vinnytsia, and Kirovohrad) attitudes towards Bandera's faction of the OUN were 3% very positive, 10% mostly positive, 24% neutral, 17% mostly negative, 21% very negative and 25% unsure. In Eastern Ukraine (the provinces of Donetsk, Luhansk, Kharkiv, Dnipropetrovsk and Zaporizhia) 1% each had very positive or mostly positive attitudes towards Bandera's OUN, 19% were neutral, 13% mostly negative, 26% very negative and 20% unsure. In Ukraine's south (the Odessa, Mykolaiv and Kherson regions plus Crimea) 1% each were very or mostly positive, 13% were neutral, 31% mostly negative, 48% very negative and 25% were unsure. In Ukraine as a whole, 6% of Ukrainians had a very positive opinion, 8% a mostly positive opinion, 23% were neutral, 15% had a mostly negative opinion, 30% had a very negative opinion, and 18% were unsure. Headquarters of the Euromaidan, Kiev, January 2014. At the front entrance there is a portrait of Bandera. 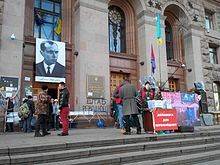 During the 2014 Crimean crisis and unrest in Ukraine, pro-Russian Ukrainians, Russians (in Russia) and some Western authors alluded to the (in their opinion) bad influence of Bandera on Euromaidan protesters and pro-Ukrainian Unity supporters in justifying their actions. Russian media used this to justify Russia's actions. Putin welcomed the annexation of Crimea by declaring that he "was saving them from the new Ukrainian leaders who are the ideological heirs of Bandera, Hitler's accomplice during World War II". Pro-Russian activists claimed "Those people in Kiev are Bandera-following Nazi collaborators". And Ukrainians living in Russia complained of being labelled a "Banderite" (even when they were from parts of Ukraine where Bandera has no popular support). Groups who do idolize Bandera did take part in the Euromaidan protests, but were a minority element. On 22 January 2010, on the Day of Unity of Ukraine, the then-President of Ukraine Viktor Yushchenko awarded to Bandera the title of Hero of Ukraine (posthumously) for "defending national ideas and battling for an independent Ukrainian state." A grandson of Bandera, also named Stepan, accepted the award that day from the Ukrainian President during the state ceremony to commemorate the Day of Unity of Ukraine at the National Opera House of Ukraine. Reactions to Bandera's award vary. This award has been condemned by the Simon Wiesenthal Center and the Student Union of French Jews. On the same day, numerous Ukrainian media, such as the Russian language Segodnya, published articles in that regard mentioning the case of Yevhen Berezniak, a widely known Ukrainian Soviet World War II veteran, considering to renounce his own Hero of Ukraine title. The representatives from several antifascist organizations in neighboring Slovakia condemned the award to Bandera, calling Yushchenko's decision a provocation was reported by RosBisnessConsulting referring to Radio Praha. On 25 February 2010, the European Parliament criticized the decision by then president of Ukraine, Yushchenko to award Bandera the title of Hero of Ukraine and expressed hope it would be reconsidered. On 14 May 2010 in a statement, the Russian Foreign Ministry said about the award: "that the event is so odious that it could no doubt cause a negative reaction in the first place in Ukraine. Already it is known a position on this issue of a number of Ukrainian politicians, who believe that solutions of this kind do not contribute to the consolidation of Ukrainian public opinion". On the other hand, the decree was applauded by Ukrainian nationalists, in western Ukraine and by a small portion of Ukrainian-Americans. On 9 February 2010, the Poland's Senate Marshal Bogdan Borusewicz said at a meeting with the head of Russia's Federation Council Sergei Mironov, that adaptation of the Hero title of Ukraine to Bandera is an internal matter of the Ukrainian government. On 3 March 2010, the Ivano-Frankivsk regional council called on the European Parliament to review this resolution. Taras Kuzio, a senior fellow in the chair of Ukrainian studies at the University of Toronto, has suggested Yushchenko awarded Bandera the award in order to frustrate Yulia Tymoshenko's chances to get elected President during the Ukrainian Presidential elections 2010. President Viktor Yanukovych stated on 5 March 2010 he would make a decision to repeal the decrees to honor the title as Heroes of Ukraine to Bandera and fellow nationalist Roman Shukhevych before the next Victory Day, although the Hero of Ukraine decrees do not stipulate the possibility that a decree on awarding this title can be annulled. On 2 April 2010, an administrative Donetsk region court ruled the Presidential decree awarding the title to be illegal. According to the court's decision, Bandera wasn't a citizen of the Ukrainian SSR (vis-à-vis Ukraine). On 5 April 2010, the Constitutional Court of Ukraine refused to start constitutional proceedings on the constitutionality of the President Yushchenko decree the award was based on. A ruling by the court was submitted by the Supreme Council of the Autonomous Republic of Crimea on 20 January 2010. In January 2011, the presidential press service informed that the award was officially annulled. This was done after a cassation appeals filed against the ruling by Donetsk District Administrative Court was rejected by the Higher Administrative Court of Ukraine on 12 January 2011. Former President Yushchenko called the annulment "a gross error". There are Stepan Bandera museums in Dubliany, Volia-Zaderevatska, Staryi Uhryniv, and Yahilnytsia. There is a Stepan Bandera Museum of Liberation Struggle in London, part of the OUN Archive, and The Bandera's Family Museum (Музей родини Бандерів) in Stryi. Stepan Bandera monument in Ternopil. Monuments dedicated to Stepan Bander have been constructured in a number of western Ukrainian cities, including Staryi Uhryniv, Kolomyia, Drohobych, Zalishchyky, Mykytyntsi, Uzyn, Lviv, Buchach, Hrabivka, Horodenka, Staryi Sambir, Ternopil, Ivano-Frankivsk, Strusiv, Truskavets, Horishniy, Velykosilky, Sambir, Velyki Mosty, Skole, Turka, Zdolbuniv, Chortkiv, Sniatyn, and in such cities and villages as Berezhany, Boryslav, Chervonohrad, Dubliany, Kamianka-Buzka, Kremenets, Mostyska, Pidvolochysk, Seredniy Bereziv, Terebovlia, Verbiv, and Volia-Zaderevatska. In 2010 and 2011, Bandera was named an honorary citizen of a number of western Ukrainian cities, including Khust, Nadvirna, Ternopil, Ivano-Frankivsk, Lviv, Kolomyia, Dolyna, Varash, Lutsk, Chervonohrad, Terebovlia, Truskavets, Radekhiv, Sokal, Stebnyk, Zhovkva, Skole, Berezhany, Sambir, Boryslav, Brody, Stryi, and Morshyn. There are Stepan Bandera streets in Lviv (formerly Mury street), Lutsk (formerly Suvorovska street), Rivne (formerly Moskovska street), Kolomyia, Ivano-Frankivsk, Chervonohrad (formerly Nad Buhom street), Berezhany (formerly Cherniakhovskoho street), Drohobych (formerly Sliusarska street), Stryi, Kalush, Kovel, Volodymyr-Volynskyi, Horodenka, Dubrovytsia, Kolomyia, Dolyna, Iziaslav, Skole, Shepetivka, Brovary, and Boryspil, and a Stepan Bandera prospect in Ternopil (part of the former Lenin prospect). On 16 January 2017 the Ukrainian Institute of National Remembrance stated that of the 51,493 streets, squares and "other facilities" that had been renamed (since 2015) due to decommunization 34 streets were named after Stepan Bandera. Due to "association with the communist totalitarian regime", the Kiev City Council on 7 July 2016 voted 87 to 10 in favor of supporting renaming Moscow Avenue to Stepan Bandera Avenue. Two feature films have been made about Bandera – Assassination: An October Murder in Munich (1995) and The Undefeated (2000), both directed by Oles Yanchuk – along with a number of documentary films. ^ a b David R. Marples. Stepan Bandera: The resurrection of a Ukrainian national hero, Europe-Asia Studies, 2006, 58:4, 555-566, DOI: 10.1080/09668130600652118. "A Second Extraordinary Congress of the OUN in April 1941 formally elected Bandera the leader of this more militant wing. As the head of terrorist activities in the recent past, he was considered the natural choice." ^ Richard Breitman. Hitler's Shadow: Nazi War Criminals, U.S. Intelligence, and the Cold War. DIANE Publishing, 2010, ISBN 1437944299, 9781437944297, p.82. "Bandera was, according to his handlers, “a professional underground worker with a terrorist background and ruthless notions about the rules of the game.... A bandit type if you like, with a burning patriotism, which provides an ethical background and a justification for his banditry. No better and no worse than others of his kind....”"
^ Volodymyr Yaniv (2004). "Bandera, Stepan". Encyclopedia of Ukraine. ^ Rossolinski, Grzegorz (2014). Stepan Bandera: The Life and Afterlife of a Ukrainian Nationalist : Fascism, Genocide, and Cult. Columbia University Press. p. 538. ISBN 9783838206844. ^ "БАНДЕРА СТЕПАН АНДРІЙОВИЧ". History.org.ua (in Ukrainian). Retrieved 6 January 2018. ^ a b Viktorovych., Chastiĭ, Ruslan (2007). Stepan Bandera : mify, legendy, deĭstvitelʹnostʹ. Kharʹkov: Folio. p. 382. ISBN 966033656X. OCLC 83597856. ^ Christopher Andrew and Vasili Mitrokhin, The Sword and the Shield: The Mitrokhin Archive and the Secret History of the KGB, Basic Books, 1999. ISBN 0-465-00312-5, p. 362. ^ Ukrainian: УКАЗ ПРЕЗИДЕНТА УКРАИНЫ № 46/2010: О присвоении С.Бандере звания Герой Украины "Archived copy". Archived from the original on 25 January 2010. Retrieved 22 January 2010. CS1 maint: Archived copy as title (link). President of Ukraine. Retrieved 22 January 2010. ^ "Texts adopted - Thursday, 25 February 2010 - Situation in Ukraine - P7_TA(2010)0035". Europarl.europa.eu. Retrieved 18 August 2018. ^ "Russia condemns Yushchenko for declaring Bandera a Hero of Ukraine". Voice of Russia. 26 January 2010. Archived from the original on 14 November 2012. Retrieved 3 May 2012. ^ Narvselius, Eleonora (2012). "The 'Bandera Debate': The Contentious Legacy of World War II and Liberalization of Collective Memory in Western Ukraine" (PDF). Canadian Slavonic Papers. 54 (3–4): 469–490. ISSN 0008-5006. ^ "Донецький суд скасував указ Ющенка про присвоєння Бандері звання Героя". Радіо Свобода. Retrieved 6 January 2018. ^ a b Рішенням суду президентський указ «Про присвоєння С.Бандері звання Герой України» скасовано Archived 15 January 2011 at the Wayback Machine, President.gov.ua. Retrieved 16 January 2011. ^ "Проект Постанови про звернення до Президента України щодо присвоєння звання Героя України Бандері Степану Андрійовичу (посмертно)". w1.c1.rada.gov.ua. VERKHOVNA RADA OF UKRAINE official web portal. Retrieved 5 December 2018. ^ "Ukrainians march in honour of controversial nationalist hero Stepan Bandera". euronews. 2 January 2016. Retrieved 27 November 2018. ^ Cohen, Josh. "Dear Ukraine: Please Don't Shoot Yourself in the Foot". Foreign Policy. Retrieved 27 November 2018. ^ "BBCUkrainian.com | Преса | Виборча: Для поляків – бандит, а для українців – герой". Bbc.co.uk (in Ukrainian). Retrieved 5 January 2018. ^ Grzegorz,, Rossolinski, (2014). Stepan Bandera : the life and afterlife of a Ukrainian nationalist : Fascism, genocide, and cult. Stuttgart, Germany: Ibidem-Verlag. ISBN 9783838206868. OCLC 880566030. ^ 1926-, Arad, Yitzhak, (2009). Holocaust in the Soviet Union. Lincoln: University of Nebraska Press. p. 89. ISBN 9780803222700. OCLC 466441935. ^ "Nazikollaborateur als neuer Held der Ukraine - Jüdische Gemeinde zu Berlin". Jg-berlin.org (in German). Retrieved 5 January 2018. ^ Himka, John-Paul. "The Lviv Pogrom of 1941: The Germans, Ukrainian Nationalists, and the Carnival Crowd". ^ a b c d "Murdered by Moscow. –  Stepan Bandera, His Life and Struggle (by Danylo Chaykovsky)". Exlibris.org.ua. Retrieved 17 March 2010. ^ a b c d "Bandera, Stepan". Encyclopediaofukraine.com. Retrieved 17 March 2010. ^ ""Мої життєписні дані" (автобіографія Степана Бандери) - Наші Герої - архів матеріалів і фотографій ОУН-УПА". Kray.ridne.net. Retrieved 18 August 2018. ^ "Ukraine :: World War II and its aftermath – Britannica Online Encyclopedia". Britannica.com. Retrieved 17 March 2010. ^ By Sviatoslav LYPOVETSKY. "Eight decades of struggle /ДЕНЬ/". Day.kiev.ua. Retrieved 17 March 2010. ^ "Nuremberg - The Trial of German Major War Criminals (Volume VI)". Nizkor.org. Retrieved 18 August 2018. ^ Mueller, Michael (18 August 2018). "Canaris: The Life and Death of Hitler's Spymaster". Naval Institute Press. Retrieved 18 August 2018 – via Google Books. ^ a b c d e f Per Anders Rudling, The OUN, the UPA and the Holocaust: A Study in the Manufacturing of Historical Myths, The Carl Beck Papers in Russian & East European Studies, No. 2107, November 2011, ISSN 0889-275X, p. 17. ^ "Ukrainian History – World War II in Ukraine". InfoUkes. Retrieved 17 March 2010. ^ Berkhoff, K.C. and M. Carynnyk 'The Organization of Ukrainian Nationalists and Its Attitude toward Germans and Jews: Iaroslav Stets'ko's 1941 Zhyttiepys' in: Harvard Ukrainian Studies, vol. 23 (1999), nr. 3/4, pp. 149—184 . ^ D. Vyedeneyev O. Lysenko OUN and foreign intelligence services 1920s–1950s (2009). "Завдання підривної діяльності проти Червоної армії обговорювалося на нараді під Берліном у квітні того ж року (1944) між керівником таємних операцій вермахту О.Скорцені й лідерами українських націоналістів С.бандерою та Я.Стецьком"" (PDF). Ukrainian Historical Magazine. 3: 137. ^ "Інститут історії України". History.org.ua. Retrieved 18 August 2018. ^ "WEST GERMANY: The Partisan". Time.com. 2 November 1959. Retrieved 18 August 2018. ^ Richard Breitman, Norman J.W. Goda, Hitler’s Shadow: Nazi War Criminals, U.S. Intelligence, and the Cold War p. 80. ^ Richard Breitman, Norman J.W. Goda, Hitler’s Shadow: Nazi War Criminals, U.S. Intelligence, and the Cold War p. 79. ^ Per Anders Rudling, Historical representation of the wartime accounts of the activities of the OUN-UPA (Organization of Ukrainian Nationalists-Ukrainian Insurgent Army), [in:] East European Jewish Affairs, Vol. 36, No. 2, December 2006, p. 173. ^ Richard Breitman, Norman J.W. Goda, Hitler’s Shadow: Nazi War Criminals, U.S. Intelligence, and the Cold War p. 83–84. ^ a b І.К. Патриляк. Військова діяльність ОУН(Б) у 1940—1942 роках. – Університет імені Шевченко \Ін-т історії України НАН України Київ, 2004 (No ISBN p.56 . ^ Grzegorz Motyka, Od rzezi wołyńskiej do akcji "Wisła, Kraków 2011, ISBN 978-83-08-04576-3, s.447, Ewa Siemaszko estimates victims to be 133,000 in Stan badań nad ludobójstwem dokonanym na ludności polskiej przez Organizację Ukraińskich Nacjonalistów i Ukraińską Powstańczą Armię, Bogusław Paź (red. ), Ludobójstwo na Kresach południowo-wschodniej Polski w latach 1939–1946, Wrocław 2011, ISBN 978-83-229-3185-1, s.341. ^ a b Bandera – romantyczny terrorysta "Bandera – Romantic Terrorist, interview with Jaroslaw Hrycak. Gazeta Wyborcza, 10 May 2008. ^ Marples, David R. (1 January 2007). "Heroes and Villains: Creating National History in Contemporary Ukraine". Central European University Press. Retrieved 18 August 2018 – via Google Books. ^ a b Ukrainian Collaboration in the Extermination of the Jews during the Second World War: Sorting Out the Long-Term and Conjunctural Factors Archived 6 January 2012 at the Wayback Machine by John-Paul Himka, University of Alberta. Taken from The Fate of the European Jews, 1939–1945: Continuity or Contingency, ed. Jonathan Frankel (New York, Oxford: Oxford University Press, 1997), Studies in Contemporary Jewry 13 (1997): 170–89. ^ p.16 "War Criminality: A Blank Spot in the Collective Memory of the Ukrainian Diaspora." Spaces of Identity 5, no. 1 (April 2005) by John-Paul Himka, University of Alberta. ^ І.К. Патриляк. Військова діяльність ОУН(Б) у 1940—1942 роках. – Університет імені Шевченко \Ін-т історії України НАН України Київ, 2004 (No ISBN p 324 "Народе знай Москва Польша, мадяри жидова- це твої вороги. Нищ їх"
^ Friedman, P. "Ukrainian-Jewish Relations During the Nazi Occupation, YIVO Annual of Jewish Social Science v. 12, pp. 259–96, 1958–59". ^ Leo Heiman, "We Fought for Ukraine – The Story of Jews Within the UPA", Ukrainian Quarterly Spring 1964, pp.33–44. ^ Romerstein, Herbert (8 November 2004). "Divide and Conquer: the KGB Disinformation Campaign Against Ukrainians and Jews". Ukrainian Quarterly. The Institute of World Politics (Fall 2004). Archived from the original on 18 May 2011. Retrieved 17 March 2010. ^ "Неизвестные опрокинули крест на могиле Степана Бандеры в Мюнхене". Ria Novosti. 17 August 2014. ^ "Бандерштадт: місто Бандер - Галицький Кореспондент". Gk-press.if.ua. 22 January 2009. Retrieved 18 August 2018. ^ "Information website of the Kharkiv Human Rights Protection Group". Khpg.org. Retrieved 17 March 2010. ^ Design by Maxim Tkachuk; web-architecture by Volkova Dasha; templated by Alexey Kovtanets; programming by Irina Batvina; Maxim Bielushkin; Sergey Bogatyrchuk; Vitaliy Galkin; Victor Lushkin; Dmitry Medun; Igor Sitnikov; Vladimir Tarasov; Alexander Filippov; Sergei Koshelev; Yaroslav Ostapiuk. "Корреспондент " Украина " События " Львов основал журналистскую премию имени Бандеры". Korrespondent.net. Retrieved 17 March 2010. ^ "Розпорядження №495". City-adm.lviv.ua. Retrieved 17 March 2010. ^ "MP: Euromaidan exposed to neo-Nazi trends - Jan. 03, 2014". Kyivpost.com. 3 January 2014. Retrieved 18 August 2018. ^ Snyder, Timothy. "A Fascist Hero in Democratic Kiev". Nybooks.com. Retrieved 18 August 2018. ^ "Hero Or Villain? Historical Ukrainian Figure Symbolizes Today's Feud". Npr.org. Retrieved 18 August 2018. ^ Пресс-служба Януковича: Указ о присвоении Бандере звания Героя Украины отменен, Korrespondent.net. Retrieved 12 January 2011. ^ "Музей Визвольної боротьби ім. Степана Бандери в Лондоні". Ounuis.info. Retrieved 18 August 2018. ^ karpaty.info. "Banderas' Family Museum — Stryj". Karpaty.info. Retrieved 18 August 2018. ^ "Відкрито музей родини Бандерів (оновлено фото)". Stryi.com.ua. Archived from the original on 11 August 2018. Retrieved 18 August 2018. ^ "ВІДКРИТО ПАМ'ЯТНИК СТЕПАНУ БАНДЕРІ". Photo.ukrinform.ua. Retrieved 18 August 2018. ^ "У Заліщиках відкрито пам'ятник Степану Бандері". Ternopil.svoboda.org.ua. Archived from the original on 16 October 2012. Retrieved 18 August 2018. ^ На Украине торжественно открыли очередной памятник Бандере [In Ukraine, another monument to Bandera was opened ceremonially]. Newsru.com (in Russian). 27 August 2007. Archived from the original on 13 November 2007. Retrieved 2 October 2012. ^ Відкрито пам'ятник Степанові Бандері [A monument to Stepan Bandera opened]. Tysmenytsia Raion Official Website (in Ukrainian). 9 October 2007. Archived from the original on 16 October 2012. Retrieved 2 October 2012. ^ "Бучач уже з Бандерою - 20 хвилин". Vn.20minut.ua. Retrieved 18 August 2018. ^ Gazeta.ua (8 December 2009). "П"ять пам"ятників Степанові Бандері, що найбільше нагадують скульптури Леніна". Gazeta.ua. Retrieved 18 August 2018. ^ "В Івано-Франківську в урочистій обстановці відкрили памятник провідникові ОУН Степану Бандері на www.vidgolos.com". Archived from the original on 28 January 2016. Retrieved 17 January 2016. ^ "У Струсові на Тернопіллі теж встановили пам'ятник Бандері - 20 хвилин". Te.20minut.ua. Retrieved 18 August 2018. ^ Kliuchak, Volodymyr (20 October 2010). У Трускавці поставили пам'ятник Бандері. Protruskavets.org.ua (in Ukrainian). Archived from the original on 16 October 2012. Retrieved 12 October 2012. ^ "Андрій Лопушанський відкрив пам'ятник Степану Бандері у Турці - FaceNews.ua: новости Украины". Facenews.ua. Retrieved 18 August 2018. ^ "У м. Турка урочисто відкрито пам'ятник Степану Бандері". Турка-перлина Карпат. Retrieved 18 August 2018. ^ "У Здолбунові відкрито пам'ятник Степанові Бандері". Newlife.rv.ua. Retrieved 18 August 2018. ^ "У Чорткові відкрили пам'ятник Степану Бандері - Тернопільська Липа". Lypa.com.ua. Retrieved 18 August 2018. ^ TV-4 (22 October 2012). "У Чорткові відкрили пам'ятник Степану Бандері". YouTube. Retrieved 18 August 2018. ^ "ВІКНА. У Снятині відкрили пам'ятник Степану Бандері. ФОТО". Vikna.if.ua. Retrieved 18 August 2018. ^ "Nadvirna city council awards honorary citizen titles to Bandera, Shukhevych, Lenkavsky - Mar. 25, 2010". Kyivpost.com. 25 March 2010. Retrieved 18 August 2018. ^ "Івано-Франківськ присвоїв звання почесного громадянина Бандері й Шухевичу". Радіо Свобода. Retrieved 18 August 2018. ^ "Про присвоєння звання Почесний громадянин міста Коломиї". 2.gov.if.ua. Archived from the original on 16 October 2012. Retrieved 18 August 2018. ^ "Бандера став почесним громадянином Луцька". Tsn.ua. 17 December 2010. Retrieved 18 August 2018. ^ "Бандера – почесний громадянин Сокаля". Zik.com.ua. Retrieved 18 August 2018. ^ "Рішення сесій". Skole-rada.com.ua. Retrieved 18 August 2018. ^ "Степан Бандера – почесний громадянин Самбора". Uk-ua.facebook.com. Retrieved 18 August 2018. ^ "Борислав. Офіційний сайт міської ради. — Головна". Boryslavmvk.gov.ua. Retrieved 18 August 2018. ^ "Степан Бандера став Почесним громадянином Бродів". Zik.com.ua. Retrieved 18 August 2018. ^ рада, Стрийська міська. "Рішення Стрийської міської ради". Stryi-rada.gov.ua. Retrieved 18 August 2018. ^ Zaxid.net. "Бандера став першим Почесним громадянином Моршина". Zaxid.net. Retrieved 18 August 2018. ^ "КАРТА М.ЧЕРВОНОГРАДА (ВУЛИЦІ) - 14 Червня 2009 - БЛОГ ЧЕРВОНОГРАДА l ГУМОР l ВІДЕО l - ЧЕРВОНОГРАД". 4ervonograd.at.ua. Retrieved 18 August 2018. ^ "Воздухофлотский проспект могут переименовать в честь Бандеры". Kiyany.obozrevatel.com. Retrieved 18 August 2018. ^ "Московський проспект носитиме ім'я Степана Бандери - КИЇВСЬКА МІСЬКА РАДА". Kmr.gov.ua. Retrieved 18 August 2018. ^ "Kyiv's Moskovskiy Avenue renamed after Stepan Bandera". Unian.info. Retrieved 18 August 2018. Wikimedia Commons has media related to Stepan Bandera.